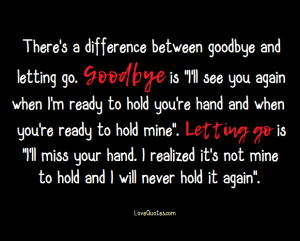 There's a difference between goodbye and letting go. Goodbye is "I'll see you again when I'm ready to hold you're hand and when you're ready to hold mine". Letting go is "I'll miss your hand. I realized it's not mine to hold and I will never hold it again".